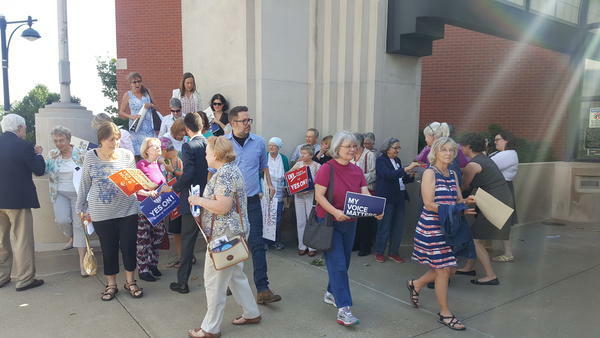 Supporters of Amendment 1 gather outside Missouri Court of Appeals during a September court hearing. Missouri’s comprehensive revamp of ethics laws goes into effect this week, as does a new redistricting process that is unique among all U.S. states. Despite passing with 62 percent of the vote in November, Amendment 1 (or Clean Missouri) still rankles opponents, who are pushing to bring the topic back to the ballot box. The push underscores the stakes for the future of both parties in Missouri ahead of the 2022 elections, when the new maps take effect. An analysis by the Associated Press found the new redistricting process would put more Democrats in the General Assembly. Greim, who works at the firm Graves Garrett with ex-state GOP chairman Todd Graves, is the treasurer of the recently launched Republican-backed campaign committee called Fair Missouri. “Some very simple fixes can be made and are necessary for this redistricting reform to work., said Greim, who didn’t rule out another court challenge since the election results are officially certified. With the new law, competitiveness and partisan fairness are primary criteria in drawing state legislative districts, just behind equal population and protections under the Voting Rights Act. And that’s unprecedented. “Missouri is the only one (state) that I know of that requires a very precise definition of partisan fairness,” said Eric McGhee, a research fellow at the nonpartisan Public Policy Institute of California. McGhee came up with that formula, known as the efficiency gap, but he was not involved in the drafting of the amendment. To put it simply: A candidate needs only one more vote than their closest opponent to win. The gap is the amount of votes in excess of that victory. In states where politicians draw the maps, McGhee said, they try to use wasted votes as a weapon against the opposite party. Ahead of the vote, supporters said the new redistricting process would help the makeup of the Missouri General Assembly better reflect the state’s voting patterns. An Associated Press analysis found that while Republicans received 57 percent of the vote in state House races this year, they ended up with 74 percent of the seats. And while fewer candidates ran unopposed this year, but not many races were competitive at the polls, according to University of Central Missouri political science professor Robynn Kuhlmann. “Given the fairly close proximity of the Republicans and Democrats, in terms of numbers in the state, we may see more and more competitive elections in some changes in terms of partisanship in the state House,” Kuhlmann said. But the efficiency gap draws the ire of people like Greim, who argue the new process diminishes the longstanding requirement of compact and contiguous districts. That’s because voters in the Democratic urban cores of Kansas City and St. Louis would likely have to be lumped in with voters from Republican-leaning and rural areas to make the numbers work. For that reason, Democrats like Rep. Lacy Clay of St. Louis and state Sen. Kiki Curls of Kansas City joined many Republicans in opposing Amendment 1, arguing it may dilute the voting power of minorities. But those who backed the amendment said they made sure to take that into account, and pointed to support from civil rights groups like the NAACP. McGhee said the goals of fairer maps and equal protection are not mutually exclusive. “(T)here are so many different ways of drawing districts that often it is possible to pursue both goals at the same time,” he said.